Belladonna is a tough perennial shrub. It is not a common garden plant. In fact, it is considered one of the most toxic plants that are available in the western hemisphere. The roots of this plant are thick and plump and look whitish. They can be as long as 6 inches and are branched. The leaves are of dull green color with the size of the leaves ranging from 3-10 inches. It has bell-shaped flowers in dull purple color. 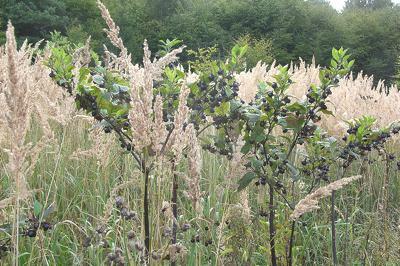 The plant produces berries in a glossy black color. These berries are very poisonous. The intake of 2-5 berries and 10-20 berries in children and adults respectively can cause death. This plant belongs to the Solanaceae family that also includes tomatoes, chili peppers, tobacco, and potatoes. It is naturally found in Europe (central and southern Europe), West Asia and North Africa (Algeria). It became naturalized in some parts of Italy. Belladonna is an Italian word that means a beautiful woman. It is believed that the women earlier were in the habit of using the extracts of this shrub to dilate their pupils. It was supposed to make them look more charming as it would brighten their eyes. Now, it is also grown in England and North America (Ohio and Wisconsin). It is known by various interesting names. For example, it is also identified as deadly nightshade, devil’s cherries, dwayberry, witch’s berry, beautiful death, devil’s herb, and tollkirsche in German. Its scientific name is atropa belladonna. The term atropa is believed to have been derived from the name of the Greek goddess Atropos. In 1753, the name atropa belladonna first made its debut in the Species Plantarum of Linnaeus. Plutarch contends that during the Parthian wars, this plant was responsible for causing the death of Marcus Antonius’ army. In his History of Scotland, Buchanan narrates that during the reign of Duncan I, the army of Macbeth tricked the attacking Danes into drinking a mixture containing belladonna. This potion puts them to sleep and facilitated the Scottish army to win the battle. Despite the extremely poisonous nature of every part of this plant, it is used for medicinal purposes. In homeopathy, belladonna is diluted so much that it hardly leaves any side effects. Belladonna is used for curing fevers, throbbing headaches and restlessness. Atropine that is available for this plant is used to cure the troubles caused by the cholinesterase inhibitors such as Parathion and Sarin. The same atropine is used by the ophthalmologists for dilating the pupils of their patients before the examination of the retina. The scopolamine and hyoscayamine that are found in the plant are used to cure intestinal disorders like peptic ulcers and yellow diarrhea. The clinical trials conducted in the Cancer Institute of Milan, Italy, concluded that the homeopathic usage of this plant is very helpful in providing relief for the women undergoing radiotherapy to fight breast cancer. It can alleviate the side effects like hot flushes, unease, and swelling. Although the entire plant contains alkaloids yet the leaves, and the berries have richer more content than the other parts. The amount of hyoscyamine and atropine present in the herb determines its properties. The root has about 0.4-0.6% of the alkaloids and in the leaves, the content of alkaloids ranges between 0.3-0.7percent. The plant is harvested when it has flowered. Then, it is dried for using in medicinal preparations. In homeopathy, the roots, fruits and the leaves of belladonna are ground together and then combined with alcohol to create the fundamental tincture. Next, this tincture is diluted to the advisable strength of 30C. This medicine is always given in low doses. The suitable dosage of this medicine depends on the patient’s age, mood, and personality. You should consult a qualified doctor before taking this drug. Available only through prescription, it is provided after it is combined with sugar pellets or with other types of medicines. It is not advisable for the pregnant and lactating women. It is also not prescribed for those having high fever, constipation, hiatal hernia, down syndrome, urinary troubles, heartburn and narrow-angle glaucoma. The user of this medicine may suffer from allergic reaction. This reaction may lead to the swelling of the face that further causes breathing trouble. It increases the heart rate, and that is why it is not recommended for those for those people who have heart diseases. The other side effects include pain in the eye, dizziness, blurred vision anxiety, hallucination, fatigue, and drowsiness.